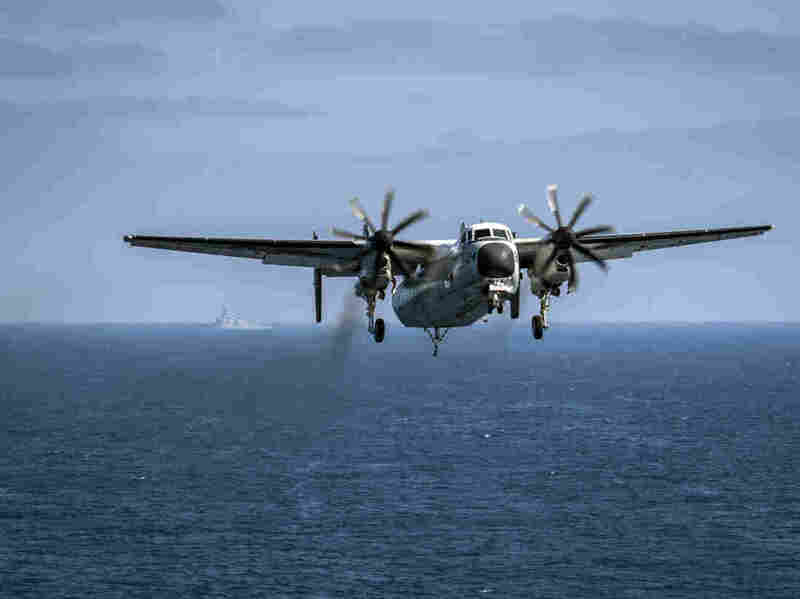 Search Continues For Missing Sailors After Navy Plane Crash In Philippine Sea : The Two-Way Three sailors are still missing after the C-2A Greyhound transport plane went down on Wednesday. Eight others have been rescued. In this image provided by the U.S. Navy, a C-2A Greyhound prepares to land in August. Three remained missing after the same type of plane crashed Wednesday in the Philippine Sea. The Navy says it has notified the next of kin of three missing sailors who disappeared after the crash of a transport plane on Wednesday in the Philippine Sea as the search for them continues. Eight others were rescued shortly after the crash. As we reported Wednesday, the twin-engine propeller-driven C-2A Greyhound, used to ferry personnel and cargo, went down about 500 nautical miles southeast of Okinawa with 11 crew and passengers aboard as it was heading to the aircraft carrier USS Ronald Reagan (CVN76). In less than an hour, eight were rescued "in good condition." But the search for the others continues. U.S. and Japanese naval forces had completed a search of more than 320 nautical miles as of Thursday morning, the Navy said. The Reagan was taking part of a joint exercise with Japan's Maritime Self-Defense Force when the plane crashed, according to The Associated Press. In a tweet, the U.S. 7th Fleet said that "next of kin notifications to inform families that their Sailors are duty status whereabouts unknown (DUSTWUN) are complete." "Our entire focus is on finding all of our Sailors," Rear Adm. Marc H. Dalton, Commander, Task Force 70, said in a statement. "U.S. and Japanese ships and aircraft are searching the area of the crash, and we will be relentless in our efforts." President Trump said in a tweet: "We are monitoring the situation. Prayers for all involved." The U.S. 7th Fleet, which covers Asian waters, has had a string of deadly accidents in the last several months. In August, the guided-missile destroyer USS John S. McCain and an oil tanker collided near the Singapore Strait, leaving 10 sailors dead. And in June, the USS Fitzgerald, also a guided-missile destroyer, and a container vessel collided near Japan.